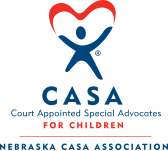 Always be the first to know about what’s going on with Nebraska CASA. Sign up for our e-mail newsletter and join our social community. These small efforts will help spread the word about our cause and make a tremendous difference.